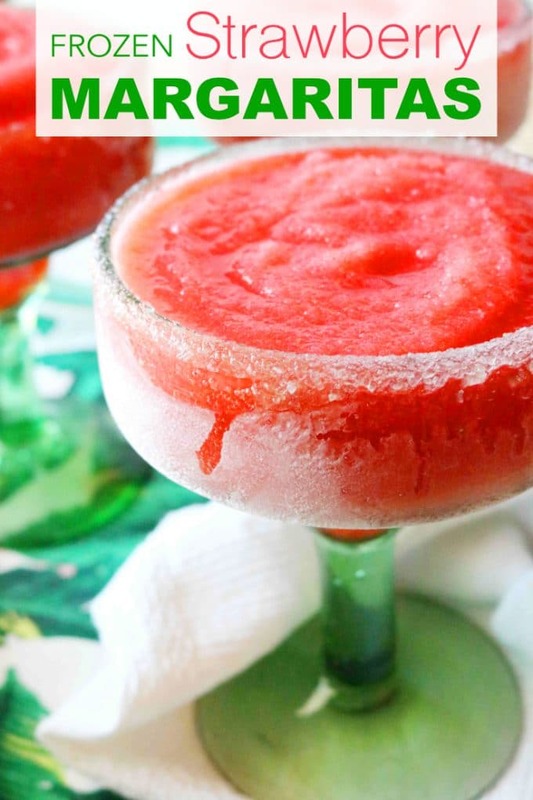 The best frozen strawberry margaritas recipe made easy with frozen strawberries and limeade! 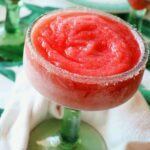 You can use top-shelf or bottom-shelf tequila for your margaritas, but silver tequila will be best suited for these Frozen Strawberry Margaritas. If you prefer a higher end tequila, Herradura Silver tequila is great. Grand Marnier and Cointreau are both great orange liqueurs, but they can be pricey. Feel free to substitute in triple sec if needed for a more budget-friendly margarita. 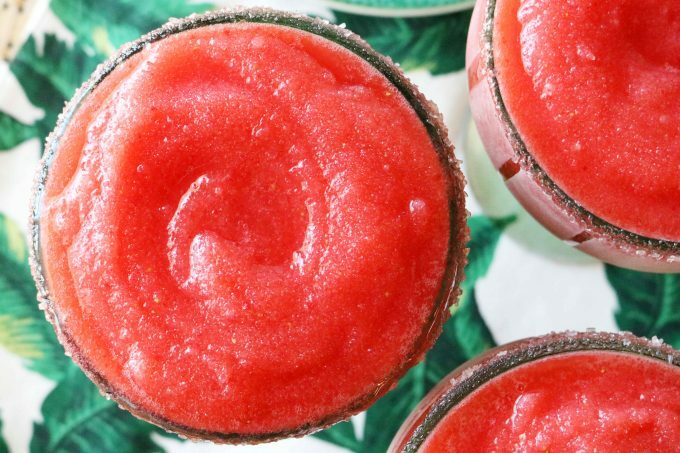 No margarita mix necessary for this Frozen Strawberry Margarita recipe. In addition to the alcohol, you’ll need frozen lime concentrate (found in the freezer section of your grocery store — usually near the frozen fruit). Frozen strawberries are important for this cocktail, as they make for a thick and frosty frozen strawberry margarita. 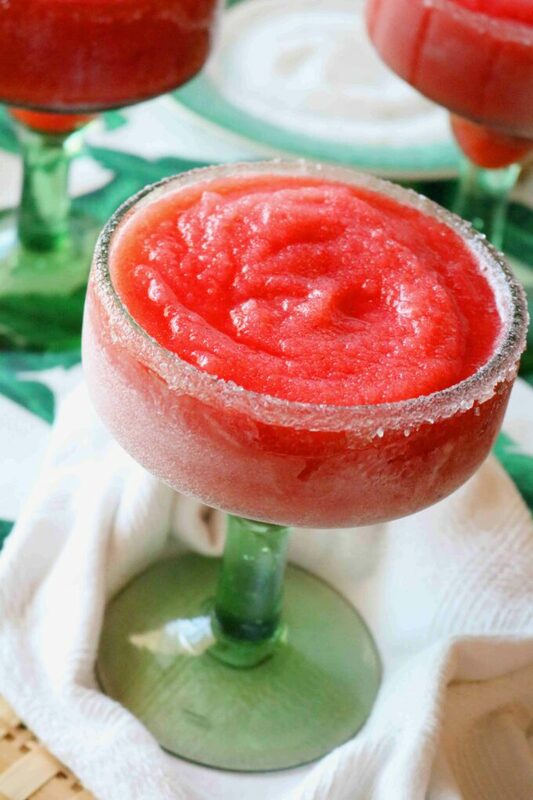 If you were to use regular strawberries, your frozen margarita would be watery. For an extra thick and frosty Frozen Strawberry Margarita, don’t forget the ice. Add in ingredients to the blender. See how easy that was? 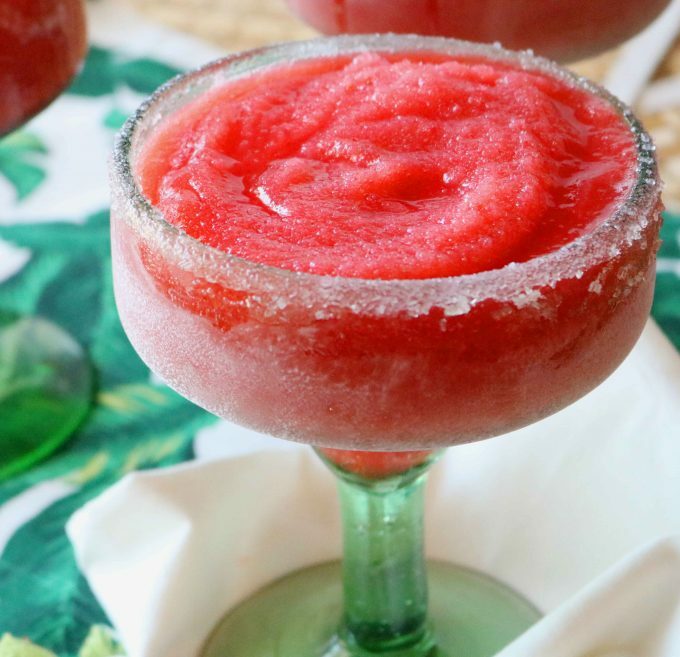 You do not have to be a mixologist to make a stellar of Frozen Strawberry Margaritas at home. Just a few ingredients and a blender. Note, the order in which you add the ingredients to the blender will make a difference, so be sure to add them as indicated in the recipe card. Once you’ve got all of your ingredients together, you simply throw all of the ingredients in a blender and start mixing on low speed. This gives your blender time to start breaking down the strawberries without stalling out. Once the strawberries are fairly broken up, you can crank up the speed and let it go until it is perfectly smooth. NO FANCY BLENDER? NO PROBLEM. You do not need a high tech blender to make a stellar batch of Frozen Strawberry Margaritas. Speaking from personal experience. I was seriously bummed when I forgot our Vitamix at home on our last beach vacation (and no, I do not travel light), but was pleasantly surprised to find that we really didn’t even need it at all. The rinky-dink blender our beach rental had stowed away in the cabinets did a fine job, and the Frozen Strawberry Margaritas at the beach tasted just as good as the ones I make at home. Peach Margaritas have all the basic components of a margarita, only they’re a bit more exciting thanks to peach liqueur and nectar! Coconut Margaritas taste like a tropical creamsicle and feature freshly squeezed orange juice, lime juice, coconut cream, tequila, and orange liqueur. The Ultimate Guide to Margaritas At Home — Top-shelf margarita at home will cost you less per drink than a bottom-shelf margarita just about anywhere else. Try these classic renditions frozen, on the rocks, or as Mexican Martini! Blood-Orange Margaritas are easy to make and a pleasant twist on the margarita! Featuring ginger liqueur and sparkling blood orange soda. If you’re on the hunt for more beverage ideas to keep you cool, you might want to check out the fruity and fizzy Pimm’s Cup cocktail, the lime-infused, minty Falernum Fizz, or the tart and refreshing Strawberry Meyer Lemon Cooler spiked with gin! 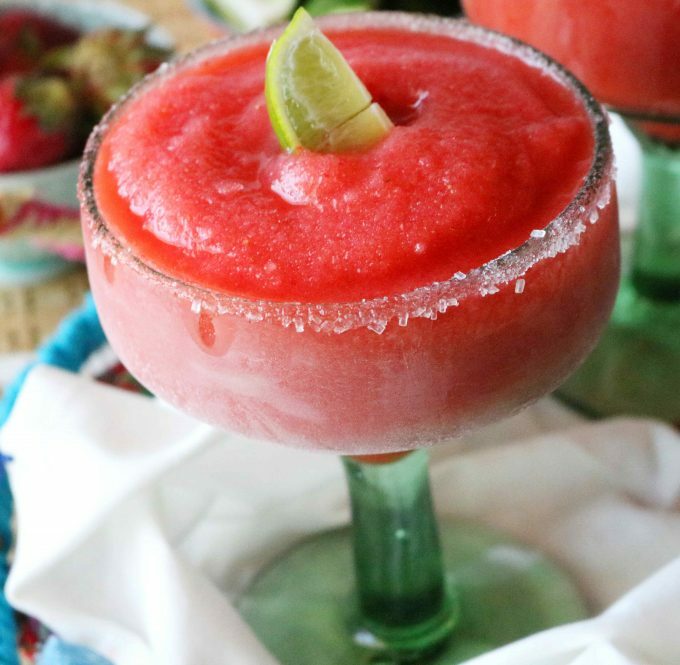 The perfect recipe for easy frozen strawberry margaritas at home! Featuring frozen lime concentrate and frozen strawberries! Add all of the ingredients to the blender in the order they are listed. Turn the blender on low to begin breaking up the up the strawberries. Then, increase the speed to high, and blend until perfectly smooth. Serve and enjoy. This sounds like the perfect margarita to me! Putting this on my must-make list for summer! I could really use a cold margarita right now. This one looks fabulous. Ha! Couldn’t we all 😉 Thank you, Lisa! What a perfect treat to cool down on a hot summer’s day! I have to have some of this in my life! Oh man, does this look inviting! I’ll take 1 or 3, let’s be honest – haha! These are so perfect for summer, pinning! 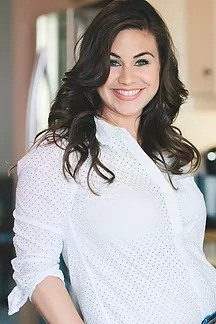 Thank you, Traci! Yes, the bottled sweet and sour is truly the worst! Ha! Yes please- top shelf all the way! I love Casamigos. I could go for one of these margaritas right now.